When the grand young man of the UDF Ministry and the perennial custodian of its exchequer, K.M. Mani, presented the State's budget for 2013-14 a few weeks ago, more than a few people in Trivandrum expected a lot from it - just as they have been forlornly expecting every since May 2011. I didn't, which is why as soon as the details were available, I was ready with a concise comment, all of one word long - Bupkis! From Yiddish באָבקעס (bobkes, “(large) beans”), from קאָזעבאָפּקעס (kozebopkes, “goat droppings”), from Proto-Slavic *koza (“goat”), and diminutive of Slavic root боб (bob, “bean”). As can be expected after two years of continuous neglect of the State Capital by the incumbent administration, there was precious little to cheer for the long suffering citizens of Trivandrum. To be fair, there was very little to cheer for anyone outside the core constituencies of the key power centers in the ruling coalition - namely Pala, Malappuram and Ernakulam. But Trivandrum has a particularly strong grouse considering how many initiatives with State-wide impact are underway or planned here. Trivandrum has a plethora of projects, big and small, that desperately needed funding in this budget. The most urgent of these, for the reason that it could cause a public health disaster sooner rather than later, is the establishment of a high capacity solid waste processing plant after the Government failed to resolve the impasse around the Vilappilsala plant even after more than a year elapsed since it was closed due to protests by the local population. Beyond lip service about establishing a waste processing plant in Chalai (which is already at the center of a major controversy due to the shaky credentials of the private company identified by the Government to implement it), no firm allotment has been made to build and operate a plant with adequate capacity for a city of over 2 Million people. Meanwhile, the mobile incinerator, procured with great fanfare, now lies idle after it became painfully evident that it was not up to the task and had been just another (comparatively miniscule at a mere Rs 2 Crores!) white elephant. Bigger projects such as the proposed 4-laning of the Karamana - Kaliyikkavila road, the expansion of the International Airport, the Trivandrum MRTS, city road development and, of course, the massive Vizhinjam deep water port project hardly find a mention, if at all. For example, even as the honorable V. S. Shivakumar proclaims in typical fashion that land acquisition for Phase I of the much delayed project has "been completed", the long suffering users of the road are left wondering how this can be true when all that has happened is that designated committee has arrived at a final estimate of land prices to be paid. Even more curious, there's no evident allocation for acquiring the land in the budget, which will cost upwards of Rs 100-150 Crores for the first Phase alone. Yes, a few Lakhs have been munificently granted but as a friend of mine put it eloquently and in not-so-parliamentary language, that will not even suffice to set up a common-or-garden-variety tea-shop, far less an urban development project for this scale! Last year, the Government "sanctioned" a number of projects for the development of the Capital city but apparently not even a single paisa has been set apart for any of them. But when we read the fine print, it becomes evident that all they sanctioned were "feasibility studies", which doesn't mean anything at all. I just hope that funds at least for these studies have been provided in the Budget, because such studies sometimes lead to outcomes, even if a decade or more later (when they are already well out of date, like the soon-to-be-concluded Trivandrum City Road Improvement Project Phase I). On that subject, there's a lot of talk about new roads, ring roads, square roads and triangular ones, but not a single Rupee in sight to fund all that gab. Most importantly, our brilliant Finance Minister has quietly put in motion one of the most subtle mechanisms to fertilize some projects and to singe the roots of others. Instead of announcing specific allocations for each major project, as has been the case in the past, he has created a "common infrastructure project fund", with an allocation of Rs 846 Crores for FY 2013, which will provide funds for Vizhinjam, Trivandrum and Kozhikode MRTS,National Games projects, Kannur Airport and "mobility" hubs (read bus stands!). This way, he can play to multiple audiences in very vague terms. For example, he can say that Rs 800 Crores out of the 846 have been allocated to Vizhinjam when soap-boxing in Trivandrum and then go to Calicut and claim that 700 of those same Crores have been allocated to the MRTS there. The truth is that he won't be quite fibbing. Really! That's because the fund can be expended on a first-come-first-served basis. So a project that's progressing on track can seek as much of the fund as possible, while one that is delayed may get nothing. It's unclear if there's a "catch-up" provision, by which the delayed project can recoup the funds that missed whenever it gets going, but I assume not. This would defeat the purpose of a revolving fund facility. It's also interesting that the Ernakulam MRTS, the darling of the CM, seems to have been left of the pack of projects snapping at each others' heels. If it is also part of the pool, I can imagine that the odds are stacked against the likes of Vizhinjam and the Trivandrum MRTS which have no political sponsors in the State Cabinet. This may be a key reason for the attempt to convert Vizhinjam from its Landlord model of development to a PPP, so that the resulting delay of at least 2 years would take it out of the reckoning for funds till the end of the tenure of this Government (if it ever makes it that far!). Fortunately, that attempt was thwarted by the timely action of Dr Tharoor, and let's hope that Vizhinjam will tap heavily into the "fund" when the EPC tender is handed out later this year. This is not the only instance of "creative accounting" in the Budget. There are a few cases where the same funds have been allotted year after year, mostly because it's evident that the beneficiary agencies are incapable of utilizing them. And Finance Ministers from both sides of the ideological divide have used this tactic many a time. For example, when there was much ado about the neglect of Trivandrum in the Budget, the Finance Minister graciously opened his purse strings to allot Rs 12 Crores for the Attukal Township project and placate the adjutant resident diety of the city. Of course, he knows full well that since the implementing agencies are the likes of the Trivandrum Corporation and TRIDA, whose magnificent track-record of project implementation will sure make him confident that not even a single Paisa would be used and he can make the same munificent offering next year as well. It would be folly to imagine that Trivandrum would ever be showered with funds, both because the Capital is short of political patrons and because the State Budget is very much a smoke-and-mirrors act due to a genuine resource crunch. More than 20% of the Government's revenues are eaten up by servicing its mountain of debt, a very large portion is consumed in pay and benefits for the army of Government employees, past and present, of whom most Chief Ministers live in terror. There's not much to allocate for development projects, major or minor, and Trivandrum is not getting much of that limited pie. Of course, there is money to splurge on the odd white elephanhant (Rs 50 Crores for the clearly infeasible and unnecessary bullet train) or the Ernakulam Metro, for which the Government is forking out an extra Rs 300 Crores this year alone. What we can hope for and what Mani saar should have done is to allocate resources smartly. In a logical world, a good starting point would be to create a simple two dimensional matrix for projects - with Project Importance on one axis and the Stage of Development of the project on the other. For example, if two projects are at the same stage of development, the more strategic one will get first priority. It's unlikely that two projects will have the same strategic importance (there's only one Vizhinjam!) but if that does happen, the one which is under construction should get more priority than one which is still on paper. Of course, both importance and progress should be objectively evaluated and not left to the purely subjective opinion of a politician or a bureaucrat. For example, one could look at the economic and social impact of each project to assign them an importance score. A project like Vizhinjam which has a national impact (by reducing the cost of logistics for exporters and importers across the country) will have greater significance than a project with a more regional impact like an airport or a city-centric MRTS. The state of progress of a project is more easily determined in a objective manner and the rationale behind the use of this parameter is to that projects that are under construction need more support than one that is on paper. This means that money should be prioritized for the land acquisition of the Karamana-Kaliyikkavila highway than for the bullet train. However, sufficient safeguards have to be built in to ensure that a particular project is not victimized for extraneous delays or that one is not soft-pedaled for the benefit of another. Moreover it may make even more sense to have separateseparate funds for feasibility studies and land acquisition, which are based purely on the importance of each project. Most of all, all of these decisions must be taken in a transparent manner by ensuring that all relevant data is published on as close to a real time basis as possible. Rather than make blind allocations, many of which will go unutilized because of the ineptitude of the implementing agencies, changes have to made to such agencies to ensure that allocated resources are used as efficiently as possible. For example, a key allocation to be made in the next Budget is sufficient funds to create a Trivandrum Metropolitan Development Authority (TMDA) in the place of the notoriously incapable TRIDA and to give the powers and resources needed to implement major projects like TCRIP Phase II and the MRTS. TMDA will be an effective vehicle to utilize funds from JNNURM II which is set to roll out shortly. The failure of the Trivandrum Corporation to effectively utilize funds from JNNURM I is a story of near-criminal negligence and waste. The effective utilization of Central Funds can help the State Budget go a little further. The meagre funds available with the State can be better allocated for tasks that only the Government can perform or which the Government can perform more effectively than a private actor, such as land acquisition, entitlements and development involving public land and public right of ways. There is very little sense in public agencies trying to compete in sectors where private capital is far more efficient, such as real estate development, air transportation and retail. Instead, it should focus on core infrastructure development - roads, railways, ports, power, water and waste management. Operations can be outsourced to more efficient, experienced private entities in return for a revenue share. 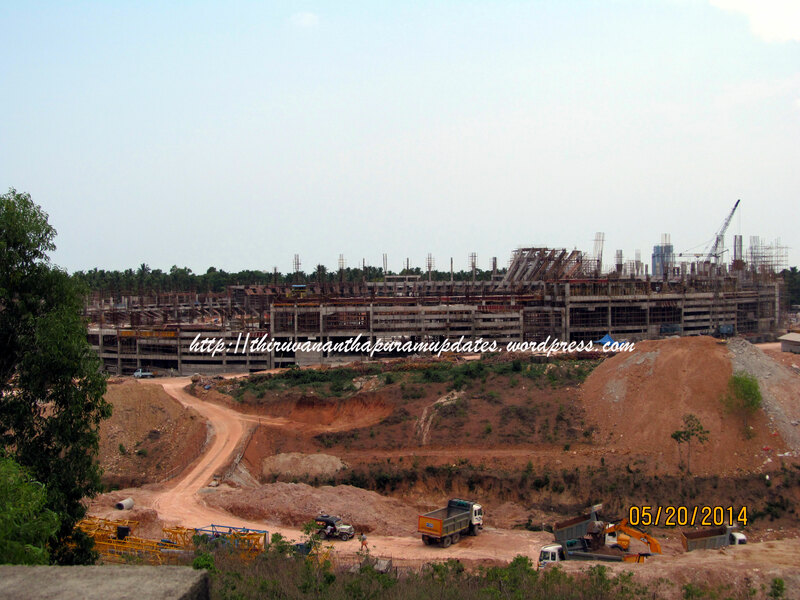 The landlord model followed at Vizhinjam is a great solution for other core infrastructure projects, combining the efficiency of Public Private Partnerships and the ability to raise funds from the capital markets, with the pragmatic ability to have Government support to backstop project debt. The Special Purpose Vehicle will allow the recruitment of the sort of talent needed to manage specialized, complex and often large projects, something which is well nigh impossible within the labyrinth of public services recruitment and pay structures. Keeping all of this in mind, I would propose that we take a time hop back before the Budget and slip the following into Mani Saar's briefcase. It all seems to stack up to a lot - about Rs 620 Crores - but it's actually only a tiny fraction (3.5%) of the State's Rs 17,000 Crore plan outlay or the Rs 10,000 Crores that Kerala paid in debt service in 2012. It's 0.5% of what this same Cabinet wants to spend on bullet trains that will carry just 45,000 wealthy people a day (if ever those elusive 45,000 can be found!) or just twice what the Cabinet just approved for the Ernakulam MRTS project alone. These are the sort of figures that drive in the sheer unfairness of the deal that the State Capital has been receiving when other States pamper their capitals with infrastructure projects galore and when Trivandrum accounts for as much as 11-12% of the Gross State Domestic Product. Trivandrum district accounts for 8 MLAs of the Indian National Congress, which is supposedly the main constituent of the ruling Front with 39 MLAs in all. That's almost as many MLAs as all of Mani Saar's multi-alphabetic conglomerate and nearly half as many as the Muslim League. Yet the people who elected these 8 worthies, who include such senior leaders as K Muraleedharan and G Karthikeyan among the ranks, have to make do with scraps at the Budget table. When will these elected supposed-representatives wake up and ask for our fair share? ?